Oudoor/Indoor Walkway Covers are designed to fit over existing walkway, providing a brand new surface with durable anti-slip performance. They cover existing grate's and platforms with an anti-slip grit surface, exceeds OSHA standards even in adverse conditions, including outdoor use. Walkway Covers are installed on thousands of steps around the world in a wide range of markets, in both new construction projects and in retrofit applications. 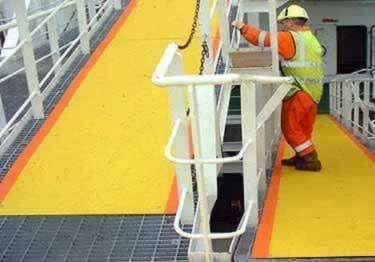 Maximum size 48" x 96"
Fiberglass Walkway Covers is our best non slip solution for grated or platform areas. Offered in 12 colors providing excellent traction. Exceeds OSHA standards. Provides steel studded traction to protect you even in tough weather conditions like mud, wet leaves, snow & ice.